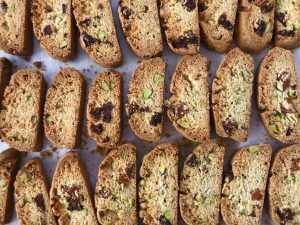 Most biscotti recipes are made with mostly eggs and a small amount of butter or none at all, which usually makes these cookies quite hard. This recipe contains more butter and less eggs which gives it a more delicate texture that’s a bit easier to chew. I used raw pistachios and dried apricots, I was initially going to use just pistachios, but my father had just returned from a trip to Armenia and brought dried apricots. Armenia is famous for it’s apricots (the scientific name for apricot is actually prunus armeniaca); apricots and pistachios are a lovely match, so I decided to combine them in this cookie. I hope you enjoy this recipe and if you don’t like dried fruit, these taste just as good without the apricots. Preheat oven to 350ºF(180ºC), line a baking tray with parchment paper and set aside. In a large bowl whisk together your soft butter, sugar, baking powder, and salt just until they are well combined, it won’t be a super creamy mixture. Crack in your eggs and vanilla and whisk until smooth, it’s okay if the mixture looks a little curdled. Add a little over half of your flour, switch to a spatula and mix that into the batter until combined. Add the rest of your flour, the pistachios, and the apricots. Give that one final mix to get them completely combined into the dough. You can finish up the mixing with your hands if it gets too difficult to mix by spatula. Shape your dough into a ball, put it back in the bowl. Use your spatula to divide the mixture into 4 equal pieces by cut vertically and horizontally through the middle like a cross. Take each piece of dough and shape into a log about 6.5inches long x 1.5 inches wide (16.5cm x 4cm). Place them onto your tray, giving them as much space as you can (I usually put them diagonally onto my tray and I manage to fit all 4 at once). Bake for 25 minutes or until they look cooked through and the have browned slightly on the out side. Cool for 10 minutes before slicing. With a very sharp, smooth-edged knife slice each log into about 11-12 pieces, each slice will be 2/3 of an inch thick (1.5cm). Place all of the slices onto the baking tray (cut side down), they don’t need to have any spacing in between. I usually end up fitting them all on one tray, minus the end pieces (those don’t need to be baked again anyway). Bake for 12-15 minutes or until the edges are golden-brown, then remove from the oven, flip them and bake for another 12-15 minutes. One they are ready they will be golden brown all over, allow them to cool completely on the tray then serve. Store in an airtight container for up to 5 days.